If you look at the culture of adult fitness in today’s society, it won’t take long to realize boot camps, high-intensity interval training, Zumba, Yoga, CrossFit, and body weight training along with countless other challenging fitness methods are the modern day trends. The key to these fitness trends is variety, and this variety is exactly what I feel motivates today’s students. The challenge for PE teachers is how to make fitness challenging, yet fun and fresh. Long gone are the days of sending students on a 5-minute jog before circling up for a static stretching routine, followed by a few push-ups and sit-ups. Because such a workout is redundant, students will become bored, and quickly lose motivation. Our goal is to promote lifelong fitness in PE, especially during our present-day epidemic of childhood obesity and type 2 diabetes. My colleagues and I are continuously searching for creative ways to motivate our students while making sure we’re focusing on fitness concepts, which include aerobic endurance, upper and lower body muscular strength and endurance, and flexibility. 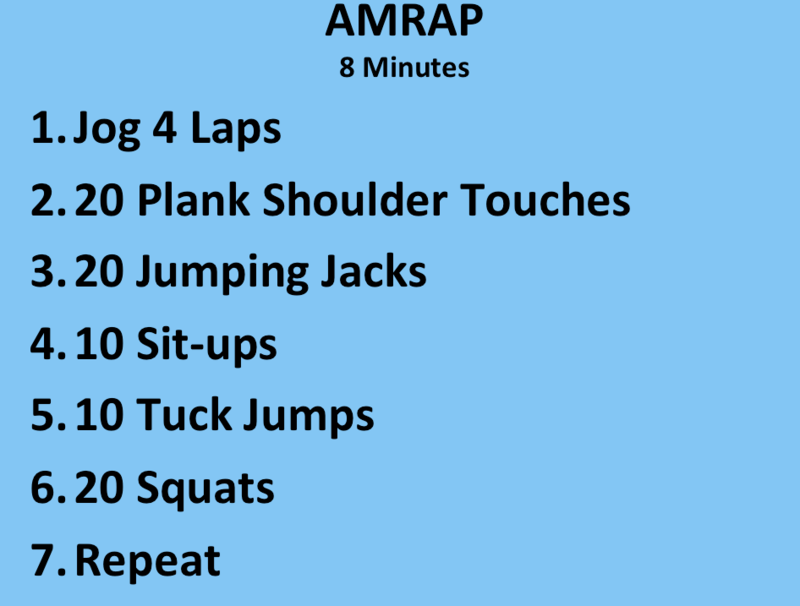 AMRAP, or as many rounds as possible, is an exercise routine recently introduced to our students by Coach Jedd Austin. Using either our projector or a whiteboard we post the days workout. We list 5-7 different exercises, each with a certain number of repetitions. Students must do each of the exercises in order to complete 1 round. After each round is completed, they collect a red ticket to tally their rounds. At the end of the session, the students count their tickets, which tells them how many rounds they completed. We never celebrate the student with the most tickets. Instead, we encourage each student for his or her effort. This has become a favorite activity among our students due to the workout’s flexibility. We can focus on lower body exercises during one class, then upper body the next. Most times we vary the exercises to include all muscle groups. We can also adjust the number of repetitions and the duration of the exercise to fit the level of difficulty. 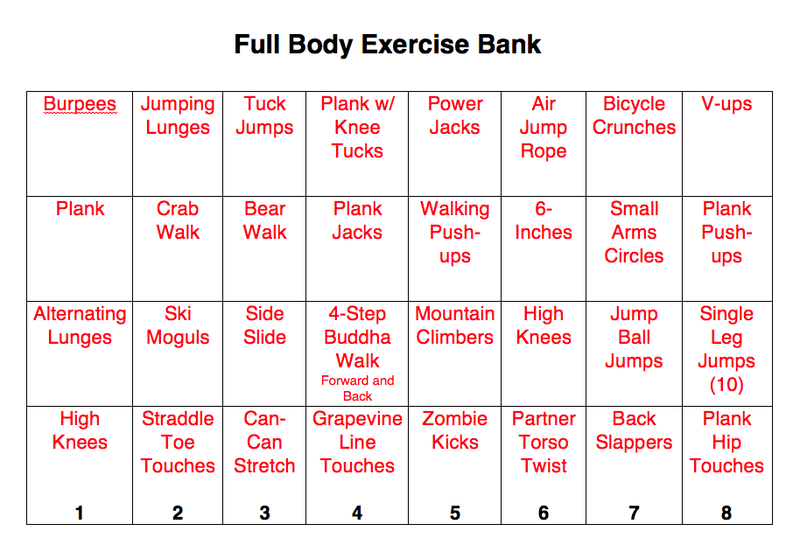 Another addition to our fitness program is the Full Body Exercise Bank, essentially a grid of exercises, as you can see below. Each of the 8 rows has 4 exercises combining upper body, lower body, dynamic stretching, and aerobic endurance. Using a Tabata-Pro timer we’ll choose one of the 8 lanes and challenge the students to complete 3 cycles. 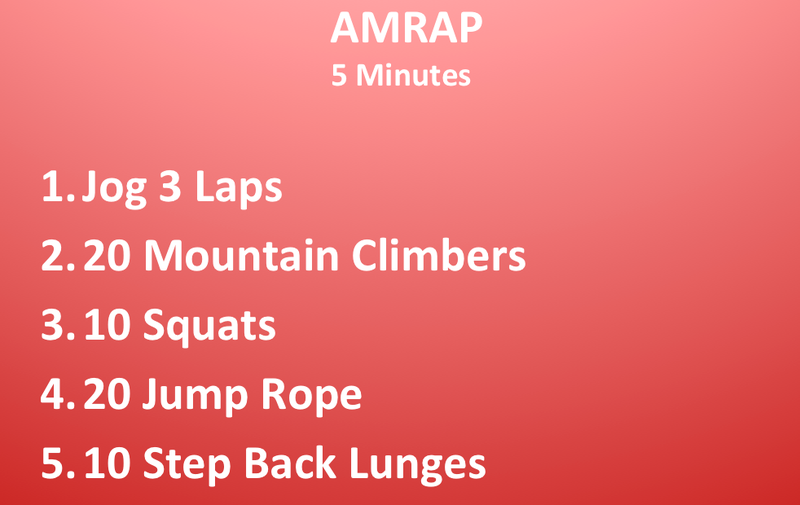 We’ll usually vary the time of each exercise from 20-40 seconds depending on the grade level and degree of difficulty. Again due to the variety of exercises, we’ve seen increased motivation and effort from our students. It’s exciting to witness and be apart of the continuing evolution of physical education class. By introducing our students to a variety of exercise routines like AMRAP, Fitness Banks, fitness-based tag games, and dances like Zumba we are helping motivate students today in order to promote fitness for a lifetime.